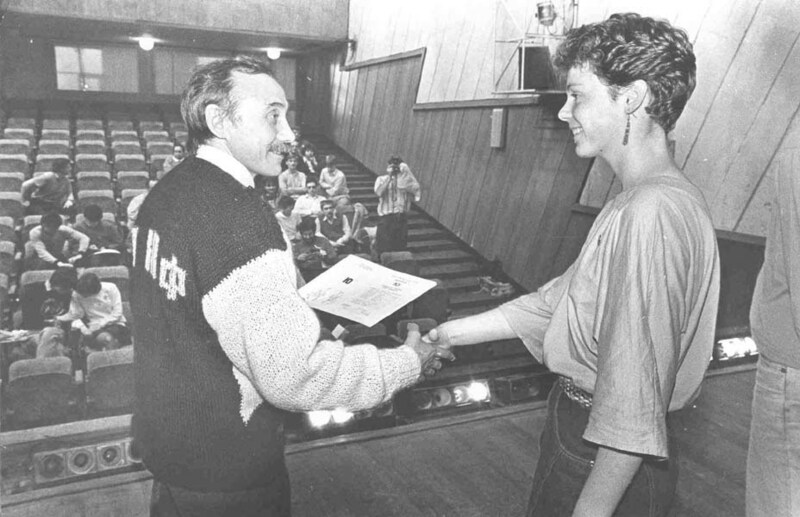 Akos Csilling and Andras Czirok, the Hungarian participants at the IYPT 1990, clarify further details of the event. Akos Csilling earned a PhD in Particle Physics from Eotvos University in 2000. After working at University College London and at CERN, he is now Senior Systems Engineer at Creative Electronic Systems, Switzerland. Andras Czirok earned a PhD in Biological Physics from Eotvos University in 2000. He is now Assistant Professor at University of Kansas Medical Center. Download: Lajos Skrapits. Palyazati felhivas nemzetkozi fizikaversenyre. KoMaL, 12, 478-480 (1989). I. M. There are some recently traced photographs from IYPT organizer Evgeny Yunosov. Can you suggest if anyone can be identified on the picture with the Hungarian team, taken presumably in 1990? I. M. There is a list of Hungarian participants, preserved by Peter Fedorcsak. Can you suggest if everything is correct, as for 1990? A. Cz. Your list of participants is interesting… indeed it can be correct! Well that guy on the photo is certainly Akos, and I completely forgot Akos Domotor and Istvan Nemeth, so one of them could be the guy on the right. I am surprised that Peter Falus was not in our team, but that is after all, possible. I. M. This diploma provides full evidence that the logo we now widely use as a scanned image, first appeared exactly in 1990. (The horses and knights looked differently in 1989 and earlier, while all the sources after 1990 had the drawing exactly as preserved on your diploma.) At a certain moment in mid-1990s someone scanned the image. What is now used at almost any IYPT-related event is a low-res scanned picture. We also now know who was the Jury Chair (a special LOC position) in 1990. A. Cs. I can also confirm that the F on the front of the diploma refers to the results. I’m sure the first team had T, the second JU, and I think the third also JU, and 4-6 got F, so that all together T-JU-F was covered. I. M. There are quite conflicting accounts on the number of Soviet and International teams in 1990. Do you possibly recollect what teams were there, in 1990? A. Cz. I remember very little about the participating teams. I certainly remember the Dutch team (I guess they won? ), but very little else — I am sorry. A. Cs. I am pretty sure there were six teams in total, two of them from the Soviet Union. They were pretty well prepared, probably gone through a selection process of several levels of similar competitions. Foreign teams had much less preparation, I was told the team from Holland received the problems on the spot. I. M. A very important issue that I would prefer to double-check, is the number of the Soviet-based teams at the 3rd IYPT. 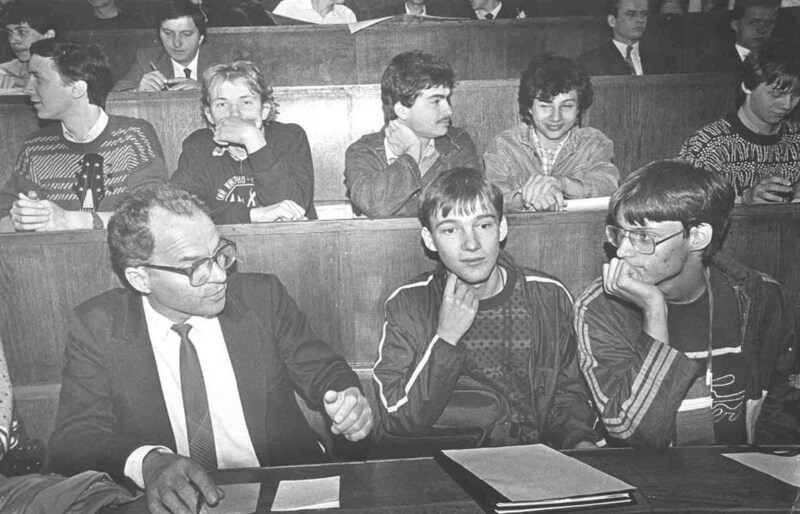 There may be, I now suspect, serious chances that several participants, who believed they have been at the 3rd IYPT in June 1990, simply misinterpreted the event with similar Tournaments, such as with the 3rd all-Soviet YPT where a UK team was reportedly present. A. Cs. I’m positively sure there were 2 Soviet teams. I can imagine quite easily that people confuse events, which may be quite similar. So this is a logical explanation. I also participated at many events around the same time, but for me, the ITYP was quite different from the others, so I do remember some details clearly. I. M. Were there any articles or reports about the 3rd IYPT in Hungarian journals? A. Cz. The problems were advertised in the hungarian monthly “KOMAL” of which I must have an archive somewhere in Hungary. I just checked that its electronic web archive is not (yet?) functional. So, within a year (huhh) I believe I may be able to dig up the problems and some photos. A. Cs. The problems were published in Komal – a Hungarian magazine for students on maths and physics. I think they have the old issues available online – I’ll check. Students were asked to submit solutions, and these were used to select the team. The introduction states that the competition was to be held in Kladno, Czechoslovakia, that the first team from Hungary participated in 1989, and that the problems were translated from Kvant 1989/8. I. M. Were there any restrictions on the number of problems left for challenge at particular Physics Fights? Were there any unexpected problems, intended to be solved immediately? A. Cs. All the problems discussed were published in advance. I do not remember any tie-breaker. On the other hand, I think there were some introductory questions, at a visit to the (Lomonosov?) University, which were used to establish the initial role of the teams. A set of 4 problems was allocated to each session, and I think the presenting team could choose which of the four to present. There were three teams in each parallel session, so one of the problems was not discussed, and there were a total of six teams. I. M. Do you have any information on when the 3rd IYPT was re-scheduled and diverted from Kladno, Czechoslovakia? A. Cs. I only had some very vague information that the competition was foreseen for Czechoslovakia, but already then I did not have any details. I. M. What were your overall impressions of the event? A. Cs. I still remember the event quite clearly. Besides the obvious interesting Physics, it was my only visit to the Soviet Union, my first management experience, and a great opportunity to practice languages. The problems were very different from what we usually did in Hungary: less claculations, more practical, and more open-ended. I only regret that we did not mix with the other teams. I. M. Thank you for all the information. A. Cz. It is very nice to think back to these times, and indeed that event was a lot of fun! The interview with Andras Czirok was taken on November 19, 2009. The interview with Akos Csilling was taken between October 29 and November 9, 2010, with updates on March 17, 2011 and May 11, 2011. UPD (July 12, 2012): A. Cz. I found your draft detailed report on the early iypt tournaments. I can tell you that there was one translator who spoke English and Russian, and each participant could choose to present in English or Russian, with simultaneous translation to the other language. official languages, so I had to translate.